remnants from Baiae, the city drowned by the Mediterranean? Achill rushed through my body as the water seeped into the wetsuit. The shiver carne not from the warm Mediterranean but from excitement. I glided toward the sandy bottom, surrounded by the Roman architecture of the sunken city of Baiae. Ancient Baiae was once the Monte Carlo of the Roman Empire, located on the Bay of Pozzuoli near what now is Naples. Luxurious villas and pavilions, built out over the sea upon raised foundations, lined the Baian coast. What now lie underwater are the ruins of what Strabo, the Greek geographer, described as "a favored city of the emperors, boasting exceptional waters, myrtle groves and mineral springs. Baiae also offered exotic delights to uninhibited seekers of pleasure...." Among those who established a residence in Baiae were the Roman emperor Nero, Julius Caesar, Senator C. Calpurnius Piso, and the young counselor, P. Cornelius Dolabella. mosaics, partially hidden beneath sand and rock, covered the floors. Romans, in the second century A.D., con-structed a protective wall 45 meters seaward of the city to check storm-tossed waves. Though the wall safeguarded them from the weather, it could not protect them from the subsiding land. Eventually, as a result of earthquakes, volcanic action and a phenomenon known as bradyseismism, the Baian coastline subsided until the entire city lay between 4 and 65 meters seaward of the land, in water 3 to 5 meters deep. Baiae is but one of many sunken cities remaining in the Mediterranean. In addition to the dozen or so submerged sites in Italian waters, underwater cities have been discovered off the coasts of Greece, France, Yugoslavia, North Africa and Turkey. The autumn air had been cool as I loaded diving equipment onto a friend's catamaran. "You can almost see your breath," I said. "Do you think the visibility will be good ?" "This is the best time of the year. The algae will be gone, and you'll be able to see everything." vered an array of treasure, including statuary of mythological gods Aphrodite and Dionysus, now in the National Museum of Archaeology in Naples. By far the most significant discovery came in 1969 when a member of the Centro Subaqueo Baiano came across a ninfio (sculptured work found in fountains of antiquity) 13 meters from shore in roughly 3.5 meters of water. Unlike the previous treasures, the ninfio was recovered off Punto dell'Epitaffio, 450 meters from the central location of the underwater city. The find turned out to be from an elaborate villa or, as experts speculated at that time, one of the many thermal baths that were popular in and around ancient Baiae. Within this huge underwater structure, divers recovered two more marble statues. Further dives two years later turned up three more marble figures along with an array of household artifacts. According to Giuliana Tocca Sciarello, superintendent of archaeology in Naples, the statues included a baby, probably a child of the imperial family, a Dionysus, and the most interesting piece of all, a well preserved, detailed depiction of Antonio Minore, who lived during the first half of the first century after Christ. "These discoveries not only put a date to the works, but confirmed the theory that this seventy-two-square-meter structure was not a public bath, as previously considered, but part of theè imperial palace that was known to have existed in Baiae." 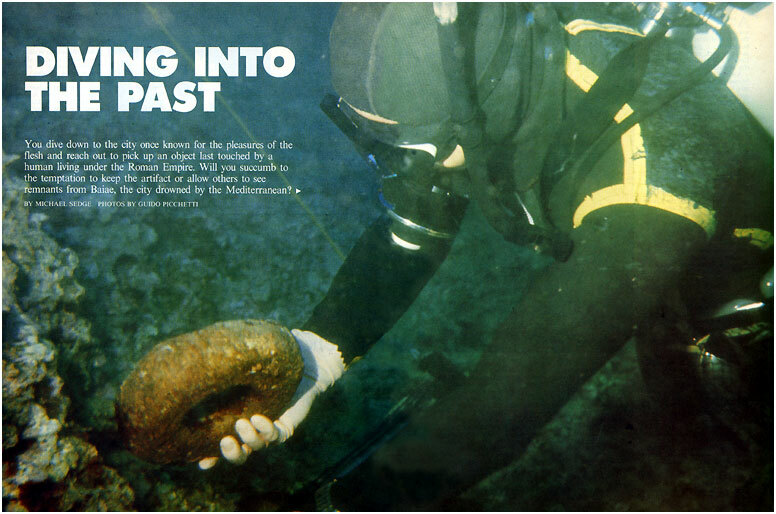 When the underwater archaeology boom swept Italy in the early 1980s, experts such as architect Antonio Di Stefano of the Centro Studi Subacquei of Naples joined the Baiae project. A scale blueprint of the ancient city and imperial villa were produced, giving experts for the first time an overall view of the remains. object protruding about 15 centimeters from theè sand. It was the top of a large amphora that probably would measure 75 centimeters if intact. Lying beside the interior wall of what may have been a villa, I found a round object about 50 centimeters in diameter with a handle on one side and spout on the opposite side. I would later find out that the piece was a third-century oil lamp. "Divers are always finding new artifacts in the city," a dive-shop owner said. "The most valuable find, I think, was a tiny marble statue about twenty-five centimeters high, in excellent condition." Thievery has become a problem in ancient Baiae. Organized artifact smugglers sell the treasures of Baiae and surrounding archaeological sites to clients in Europe and Japan. 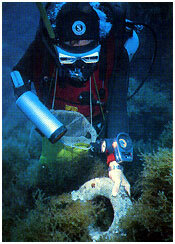 And what about the legal restrictions on removing artifacts from Italian waters without permits? "This country is full of ancient finds," the shop owner said. "If you find something, you're a fool if you don't keep it." 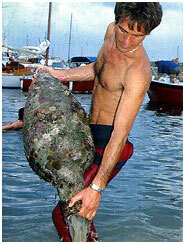 This finders-keepers attitude is typical of many divers. 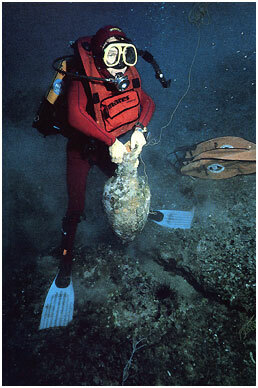 According to the regional minister of antiquities, however, divers with minor finds can easily and legally keep possession of the artifacts if they report them and obtain a holder's permit. For valuable discoveries, which are taken by the state, divers receive a cash award of 25% of the artifact's assessed value. 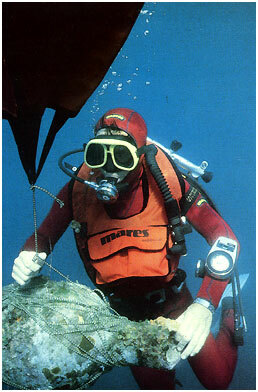 This was the case when the Riace Bronzes were discovered in 1972 by an amateur diver off the coast of Reggio Calabria. The statues' estimated value was $ 2 million. According to Giuliana Tocca Sciarello, "There is an underwater museum here far greater than that of Pompeii. 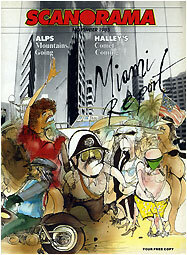 When the water is clear, one can easily see the remains of the city." A diver described it this way: "Before the dive I thought it was going to be dull. But once down there it hits you—centuries ago people actually lived here."